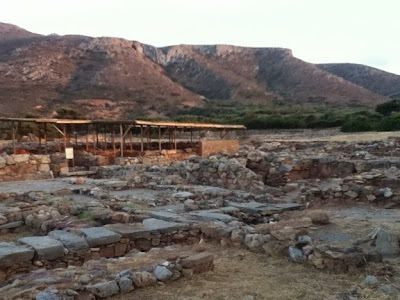 I spend a lot of time at Palaikastro, working for the excavations of the Bronze Age settlement which lies at the foot of Mount Petsofas, just beyond Hiona Beach. This area is breathtakingly beautiful. Due to the so-called 'Alpha Zone' which surrounds archaeological sites, building is restricted in this area. It is also fairly inaccessible, except by 4x4, again restricting development of this stark coastal strip. With the exception of a couple of shepherd huts and some abandoned lime kilns, there is nothing man-made as far as the eye can see. 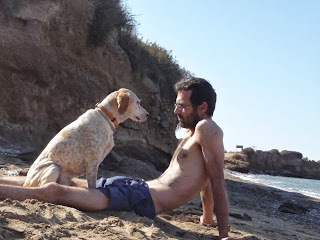 I love exploring this coastline, finding small coves for swimming, looking for evidence of Minoan civilisation (walls and pot sherds can be seen all over as the coast slowly erodes), and just sitting enjoying being absolutely in the middle of nowhere...with my dog. However, I am going to have to be a bit careful with this post for several reasons. For a start, there are signs forbidding dogs on both Hiona Beach, and the smaller coves to the South-east. I have been there, often, for an evening swim with Sage, but I feel I can't exactly recommend a beach that specifically states that dogs are not allowed. 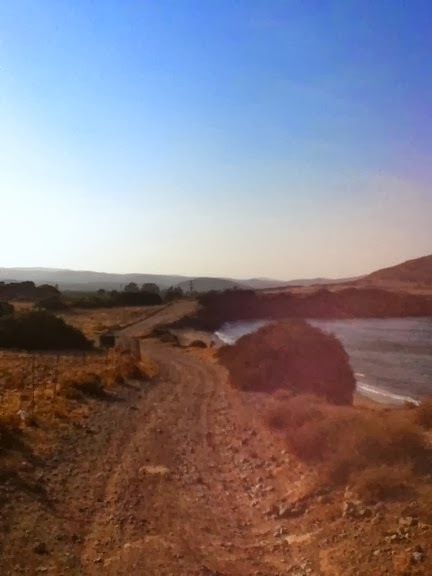 A dirt road runs behind Xiona Beach, passed the small coves, and continues up and around the coast to Skinias Beach. Along this path you can access the sea at various points, including some smooth limestone plaques that slope gently to the water, with overhanging rock for shade, and tiny deserted beaches. Secondly, I absolutely recommend stopping to visit the wonderful archaeological site of Palaikastro, although this is not a dog-friendly activity - please leave dogs outside the site as the remains are fragile and in need of preservation. This site is free of charge and always open to visitors. Information boards provide basic descriptions of the various buildings that have been excavated and you can see some of the wealth of finds, including the unique gold and ivory statuette of a (presumed) worshipper, in the museum at Siteia. However, I believe that the best thing about this site is its location. It is a very romantic area, especially in the early evening when the hills behind the site turn yellow and pink. 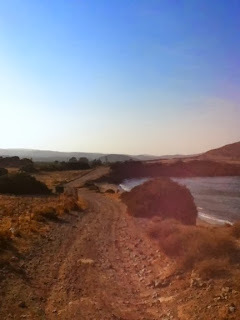 I think it is fairly easy to see why the Minoans would have chosen this place to live, with access to the sea, a nearby river, coastal plains for crops. 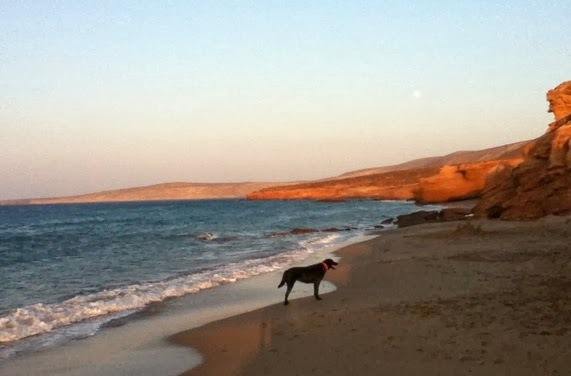 My final hesitation with this post is due to a rumour I heard this year about planned development of this coastline. There is talk of a deluxe golf resort somewhere along the path between Hiona and Skinias. I feel a bit divided on this one. On the one hand, it is a long stretch of coast, and a well planned, discreetly constructed resort that brings the economic benefits of tourism to the area has to be a good thing. On the other hand, this stretch of coast is fantastic for its stark emptiness. It's this sense of complete isolation and being in the middle of nowhere that makes it so special. With the construction of a resort, and new roads to access a new resort, I worry that this special place would lose something. 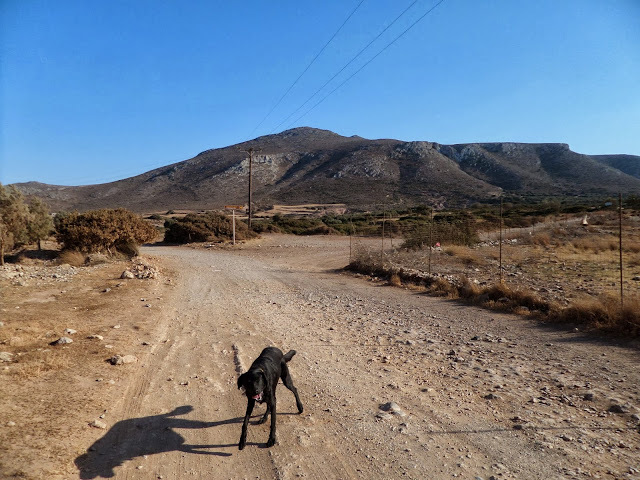 As well as wandering along this coastal path, you can climb the steep but relatively easy path up to the Minoan peak sanctuary at Petsofas (to be described in a later post). From here you have truly spectacular views of the coast, almost as far as Zakros, and the fertile plains between Palaikastro village and Kastri down by the sea. 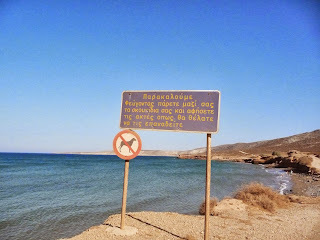 You can also follow small tracks (mostly signposted) to the small Karoumes Beach, and even further on to Kato Zakros. These paths take you winding through mountains and olive groves, and really give a sense of escape from the well-trodden tourist routes. They do require a bit of care however - carry water with you, wear suitable shoes, and time your hike to avoid excessive heat. This area is best explored with a picnic, plenty of time, and, of course, your dog!